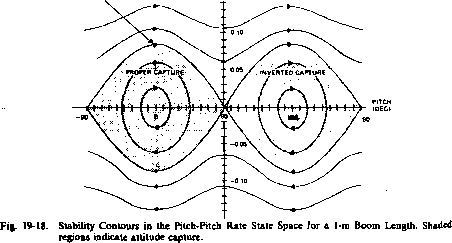 and negative pitch rate represent backward and forward tumbling, respectively. The action of the damper causes the attitude to move to trajectories with smaller rates and, ultimately, to proper or inverted capture. Extending the boom to approximately 13 m at the point marked by the arrow in Fig. 19-18 increases the transverse moment of inertia by approximately 30%, halves the pitch rate, and causes the attitude to switch to a closed trajectory about pitch zero. The real-time displays observed during actual boom extension and wheel acceleration are shown in Fig. 19-19. The attitude solutions typically lagged 20 to 40 sec behind real time and command initiation and uplink required an additional 5 to 10 sec. Figure 19-19(a) illustrates both that the boom extension command was sent after roll librations had damped and that the pitch rate decreased after extension to conserve angular momentum. The wheel acceleration command (see Fig. 19-19b) was transmitted 33 min after boom extension at a predetermined pitch angle so that the gravity-gradient and wheel acceleration reaction torques-would oppose and minimize pitch librations after the maneuver. Operational considerations dictated that the two commands be sent over a pair of command stations in daylight with adequate telemetiy visibility before and after each command. Dynamical considerations dictated a half-hour command separation (for torque opposition) and a small yaw angle to ensure yaw capture and minimize roll-yaw librations. These constraints limited command opportunities to an average of approximately one per day. After 2 days of monitoring potential command opportunities, the maneuvers were initiated despite a yaw angle near the maximum value for satisfactory dynamics [Lerner and Coriell, 1975]. Figure 19-20 compares the observed attitude data (dots) with a postlaunch simulation (solid line) during and after the boom and wheel commands. After boom extension, a pitch libration, with an amplitude of approximately 40 deg, was induced while roll and yaw remained near their initial values of 2 deg and 80 deg, respectively. The wheel was accelerated 33 minutes later, when the wheel acceleration and gravity-gradient torques were in opposition and the 40-deg pitch libration was consequently reduced to about 15 deg. Hie wheel momentum coupled the roll and yaw motion, resulting in an initial 60-deg amplitude yaw oscillation and an 8-deg roll oscillation with a 9-minute period. In Fig. 19-20(b), the attitude behavior 16 hours later is shown. 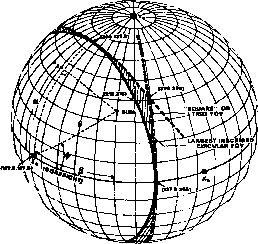 As described in Section 18.3, pitch, roll, and yaw oscillations have decayed with time constants of approximately 4 days, 6 days, and 5 hours, respectively. Thus, the large yaw oscillation rapidly decayed, the roll oscillation remained near the small initial value, and the pitch oscillation was subsequently reduced from 10 to 3 deg by a deadbeat boom retraction and extension as described in Section 19.5.2. Experimental operations were initiated 4 days after launch. 1. Barba, P., and J. Aubrun, Satellite Attitude Acquisition by Momentum Transfer, Paper No. AAS 75-053, AAS/AIAA Astrodynamics Specialist Conference, Nassau, Bahamas, July 1975.